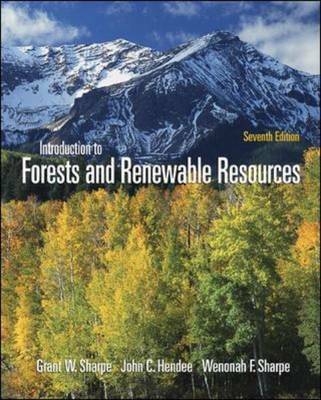 This introduction to forestry text embraces changes in policies and practices related to the conservation and management of forests and other renewable resources in the U.S. and other countries. Sharpe et al. features a thorough updating of the text including new or revised material on future values and the importance of forests with respect to global warming, world trade, renewability and sustainability, and ecosystem concerns and that's just in chapter one. Additional revisions or additions will include historical range variability (HRV) the latest ecosystem management strategies, Green Forest Certification for sustainability in the Ecology and Silviculture and Forest Ecosystem Management chapters; Satellite imagery in fire control and assessment of effects in the Fire Management chapter; expanded coverage of ecotourism in the Outdoor recreation and Wildlife Management chapter; updated material and new examples in the Urban Forestry chapter. There will also be new case studies in Chapter 2: Forest and Renewable Policy: Historical Developments and current Application, and Chapter 18: Forest Management by the States, Internet applications for forest policy, Green Forest certification and sustainability and public input and satellite imagery and many others.